"Bohemian Rhapsody" is a song written by Freddie Mercury, originally recorded by the band Queen for their 1975 album A Night at the Opera. But now its a part of our cultural landscape. Popular+strange+YouTube=parody heaven. Bush does Bo Rhap. Not all that pleasant, but impressively edited. Political Rhapsody, from the 2004 presidential election. Stand-up comedian Lee Evans performs it in pantomime. The Biblical version, Bethlehemian Rhapsody by The Apologetix, retells the story of David and Goliath. The music video is followed by an amusing “making of” documentary. All Your Base Rhapsody (original is here). The British Royal Navy lipsyncs to Queen in Rhapsody on the Sea. Chavhemian Rhapsody. As an Yank, I don’t understand this all. The Texas Longhorn Marching Band. Lost Rhapsody by Weird Al Yankovic (referring to the first season of the TV series). But my favorite version is not a video at all, its a pictograph entitled Birmingham Rhapsody! 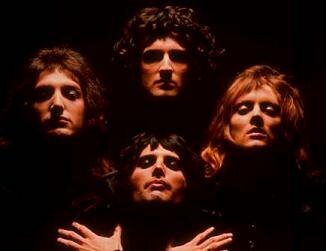 You’ll find the history of Bohemian Rhapsody and about ten times this many parodys and remixes today at Miss Cellania. But the question still remains as to whether Scaramouch will ever do the Fandango. There is another version by a band named "molotov" funny to is called "Soda Rap y Bohemia"
said john on January 10, 2007 5:55 PM. if you go to the myspace page of a band called mammoth grinder (you can guess the URL) the have an amazing version. said bokchoiy on January 10, 2007 7:02 PM.